Date & start time: Tuesday 27th July 2010, 12.15 pm start. 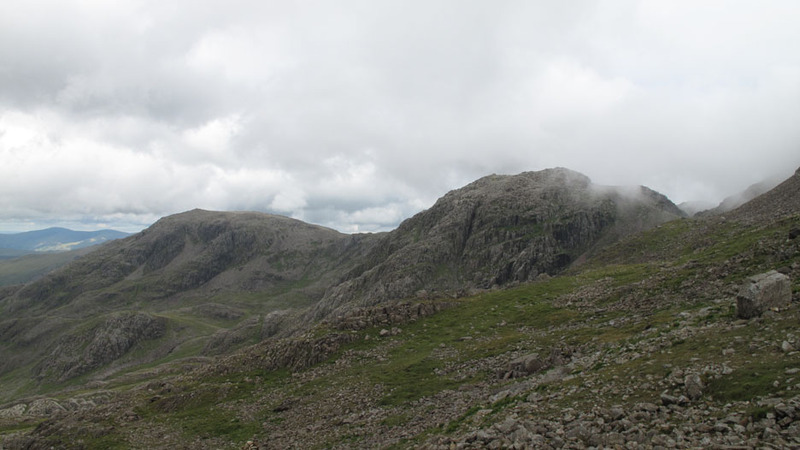 Places visited : Lingmell Gill, Hollow Stones, Lingmell Coll, Scafell Pike, Lingmell and back down the Lingmell ridge via Goat Crags. 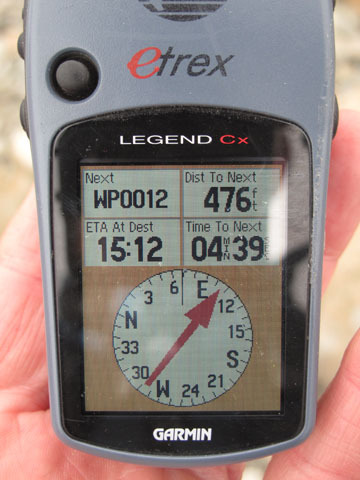 Walk details : 5.9 mls, 3200 ft, 6 hrs 5 mins including lunch. 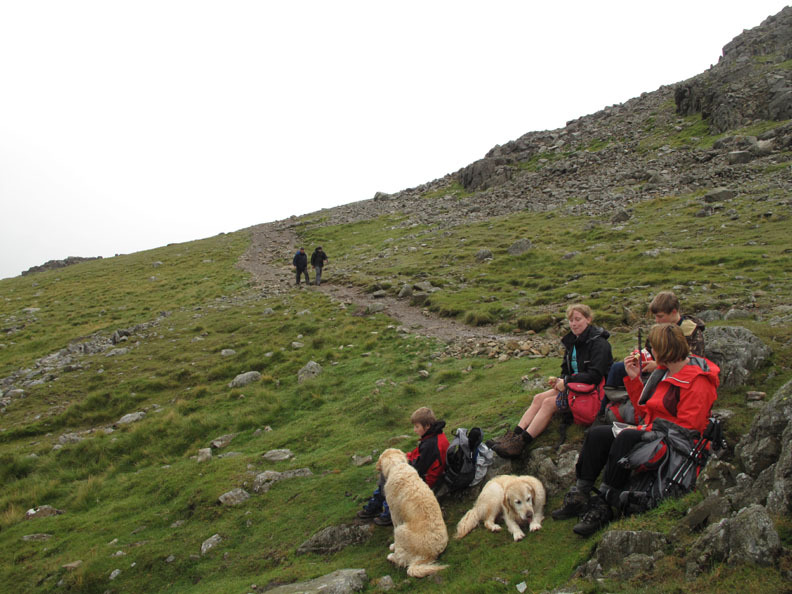 Walked with : Paula, Jenna, Sam, Thomas and the dogs, Harry and Bethan. Weather : Low cloud, rain and drizzle gradually clearing. 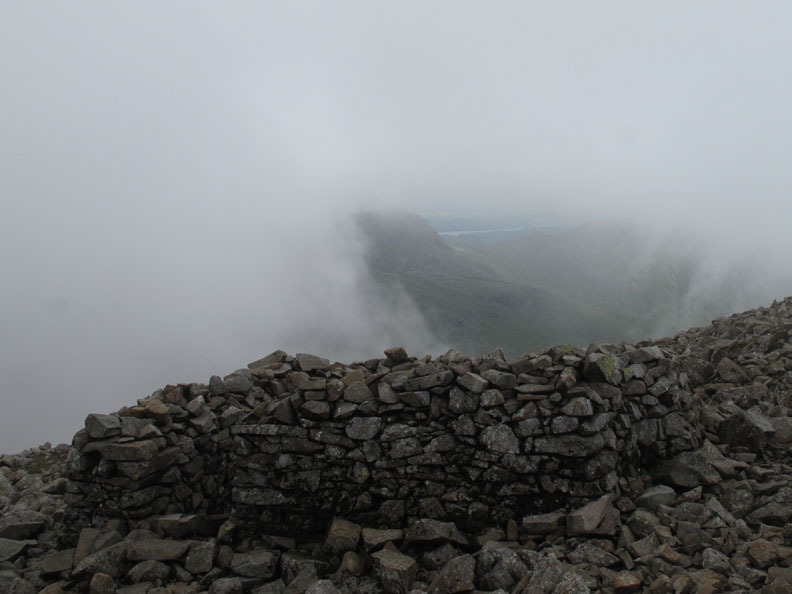 Our one day delay is not looking sufficient for our walk up Scafell Pike. 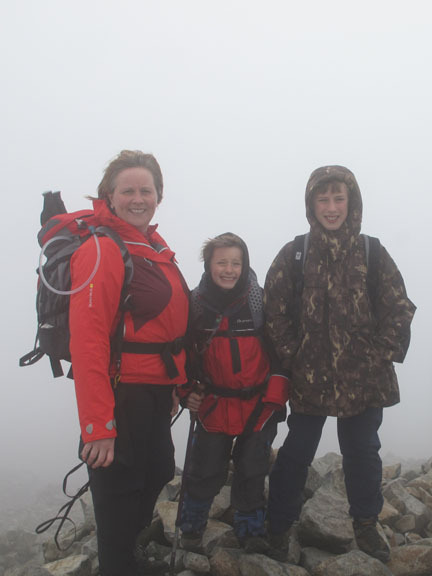 and cross our fingers for a break in the weather so that the boys can reach the top. 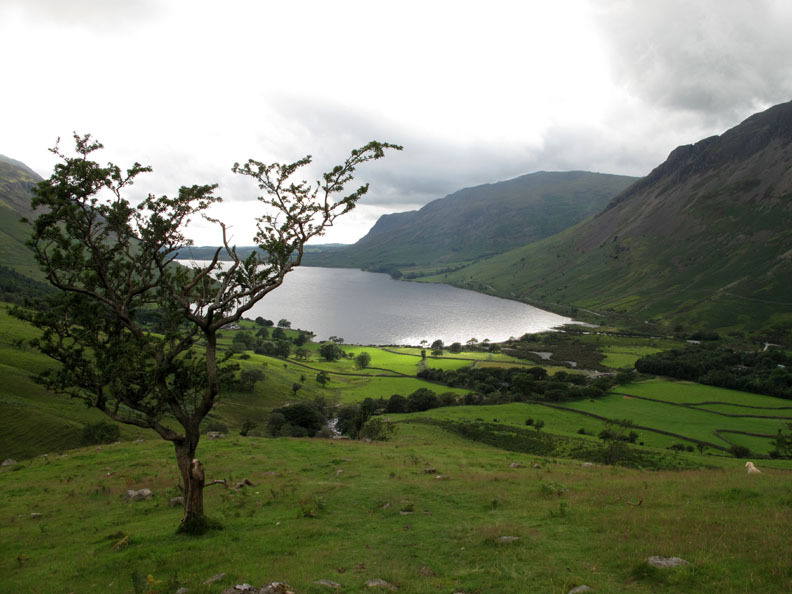 Well Wasdale was wet and the windscreen wipers confirmed the weather report. It suggested rain in the morning but gave a slight hope of an improvement after midday. and wait to see if the weather would improve after the clock struck twelve. Damp pathways outside the hotel entrance. 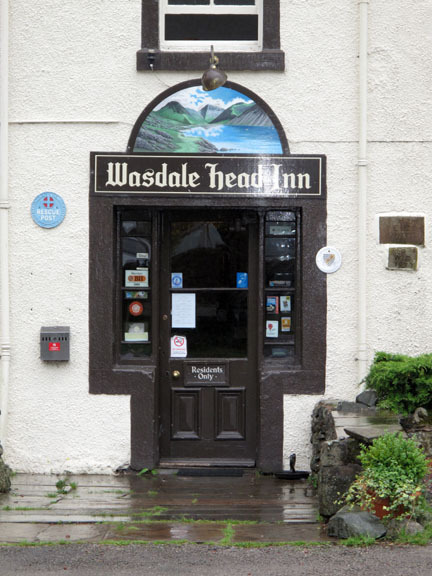 Wasdale Head Inn was famous as the birthplace of climbing and many classic old pictures adorn the walls of the hotel and bar. One such is a sepia photo of a climber attempting the "Barn Door Traverse", a photo of which is also displayed prominently in Fishers. I hope I remembered the layout in order to copy it here . 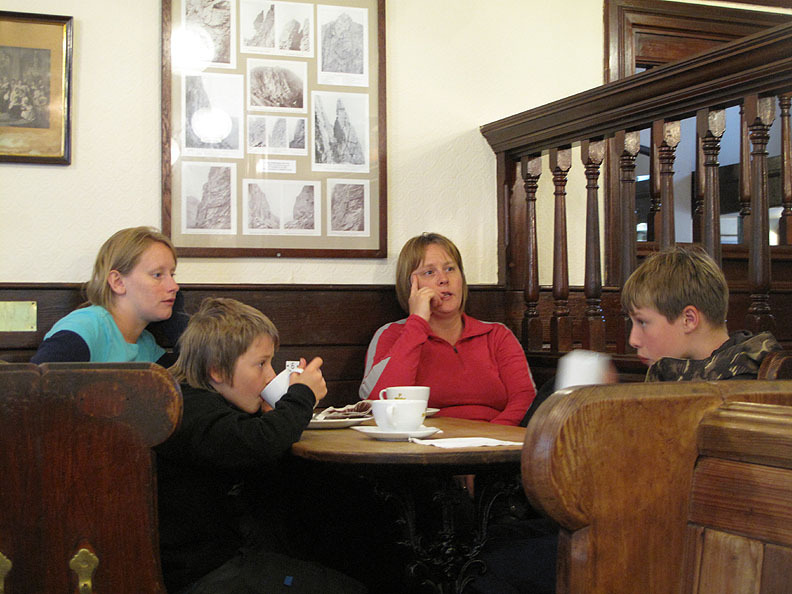 . . Move your cursor over the right hand picture to see the old photo. 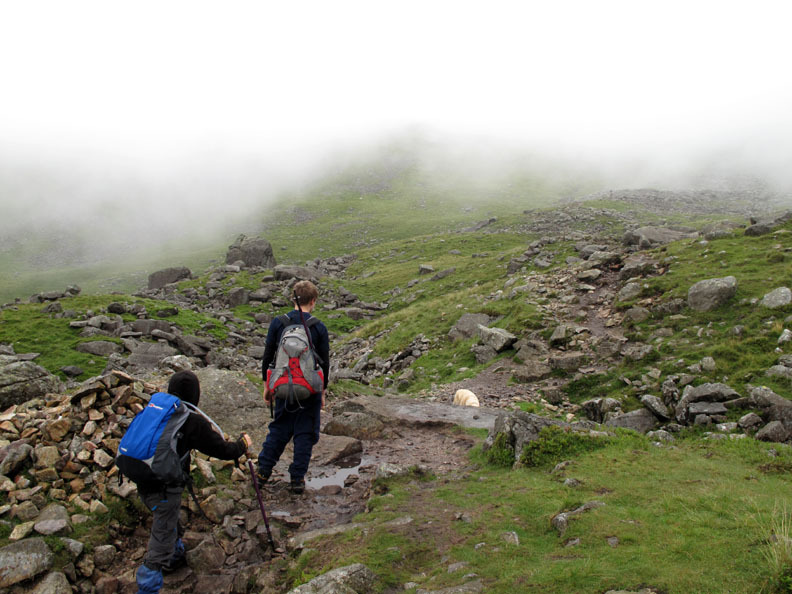 the rain had stopped and the cloud had lifted slightly to reveal the start of the climb. Sam, Tom, Jenna and Paula. 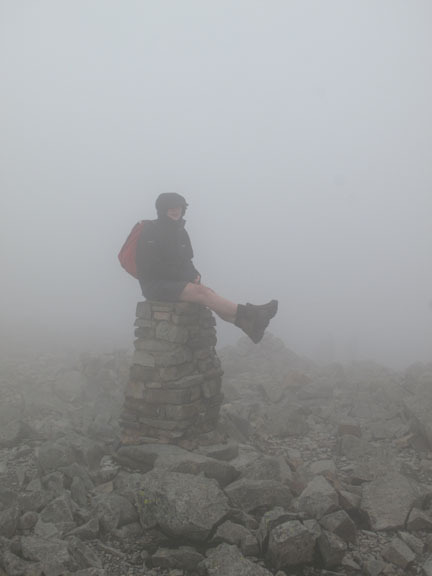 Mountain Challenge reports I have done over the last few years. Some times my marshalling duties meant that I proceeded no further up the mountain than this patch of grass. Today we would all hopefully reach the summit, high up in that big white cloud . . . weather permitting ! The weather has definitely taken a turn for the better . 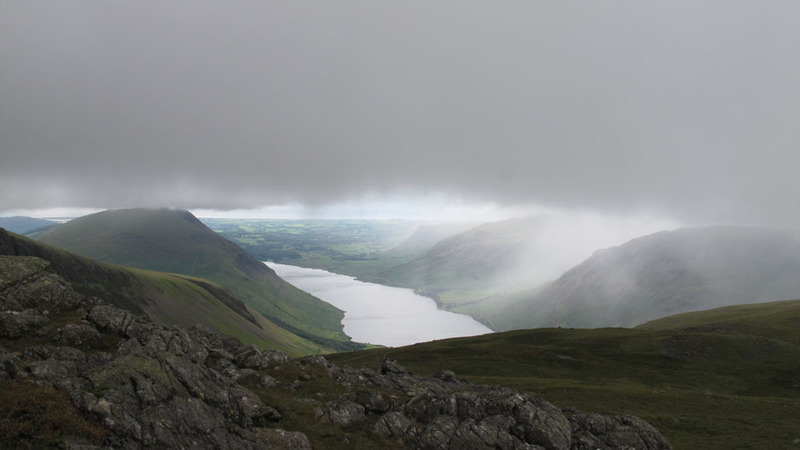 . . Wastwater, Middle Fell and Buckbarrow are clear of the mist. It's warm and muggy and everyone stops to take of jackets and waterproofs. 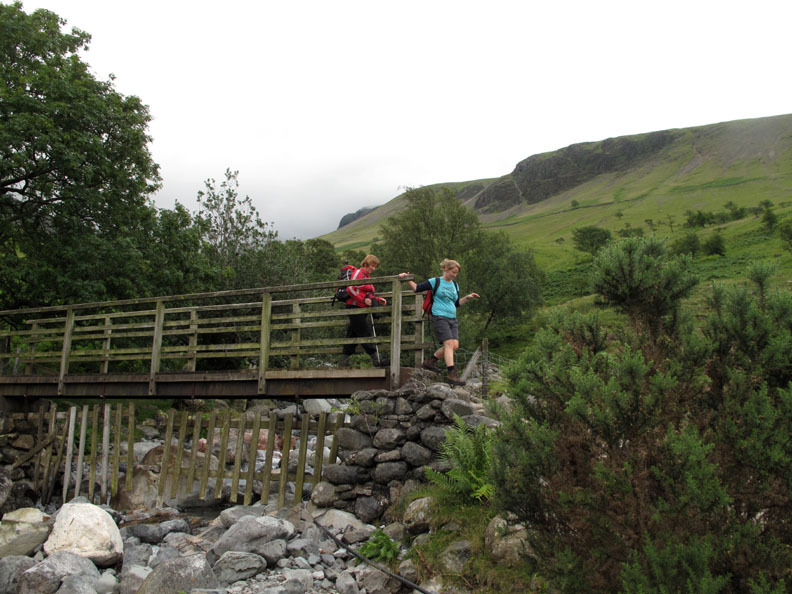 Tom's picture as we cross through the second gate on the Lingmell Gill ascent. 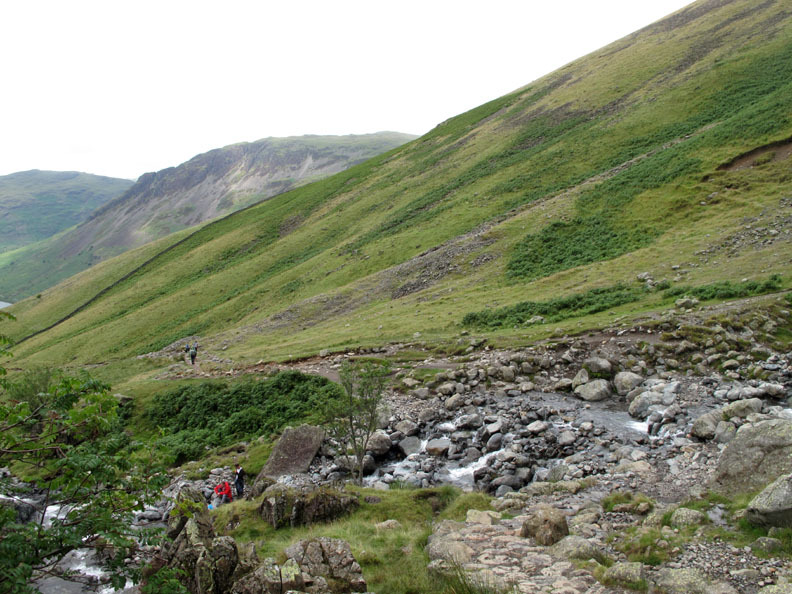 The Lingmell Gill crossing, relatively easy despite the recent rain. Making our way up Brown Tongue on the pitched path. 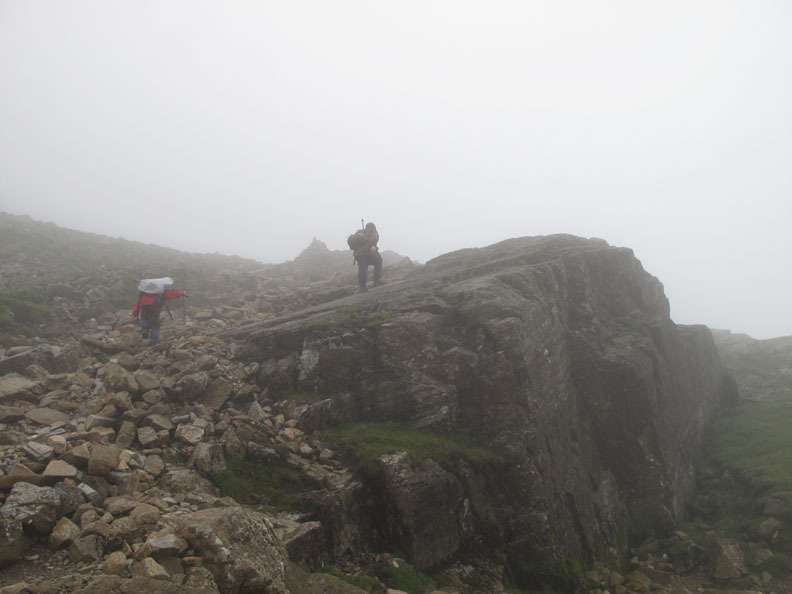 The stone pathway makes ascent easier and has reduced the erosion but it is still hard work. and soon we would probably be engulfed by it. Hollow Stones . . . more a hollow or depression full of stones than a geological statement. 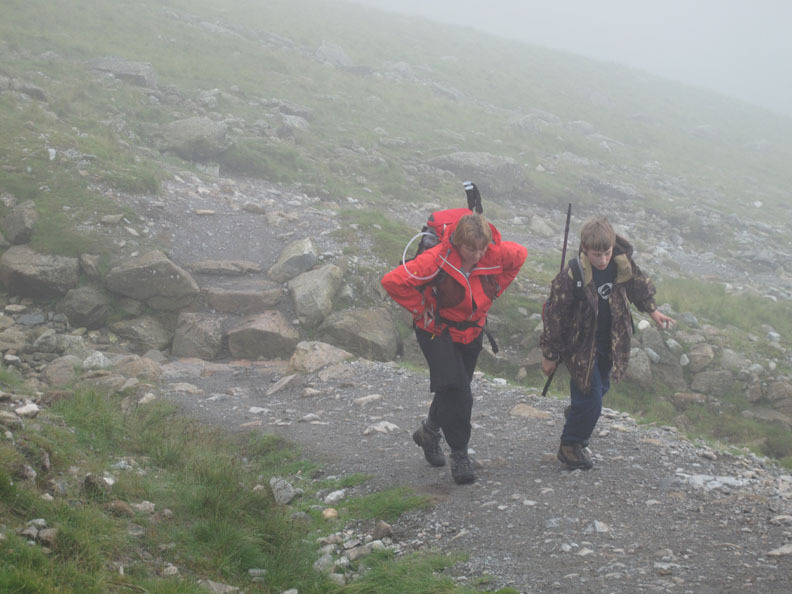 Here we entered the mist and it was time to put those waterproofs back on. Despite being a popular path, we still managed to lose the track for a few minutes amongst the boulders in Hollow Stones. 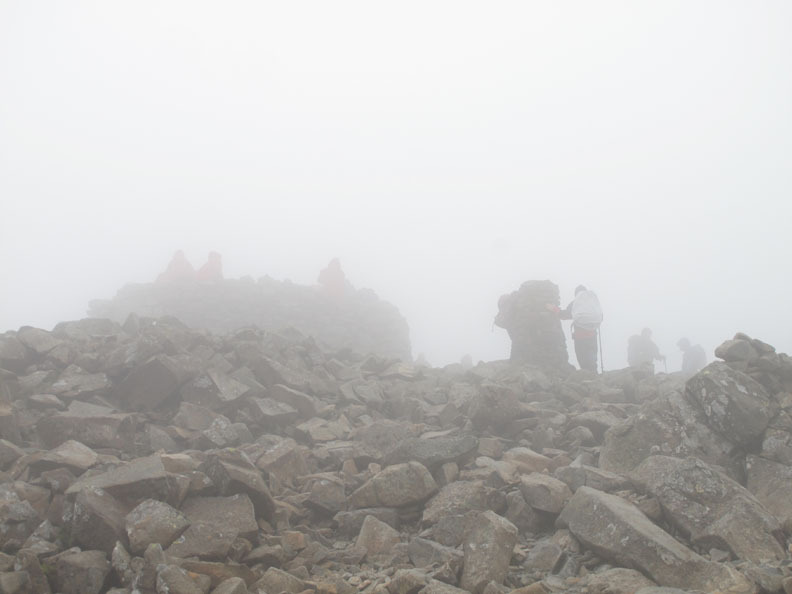 However, there were a large number of other people climbing up and back to the summit and the path was soon regained. Oh No . . . the dreaded National Park Digger has been up here too !!! and swings back and forth across the gently easing slope in most unnatural curves. What a shame . . . why not stones here too ?
. . . ready for that last climb to the top. 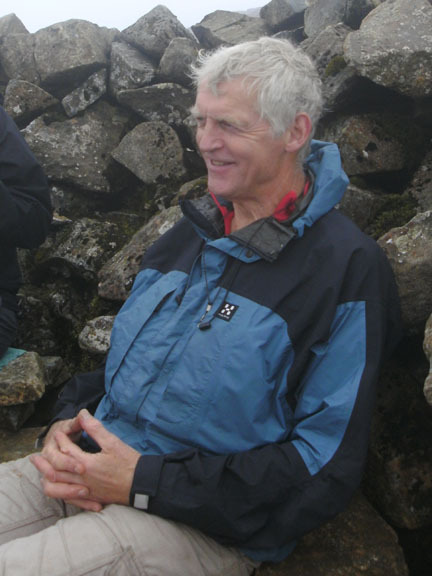 There's still rain in the air but the clouds have now lifted clear of Illgill Head and the Screes. 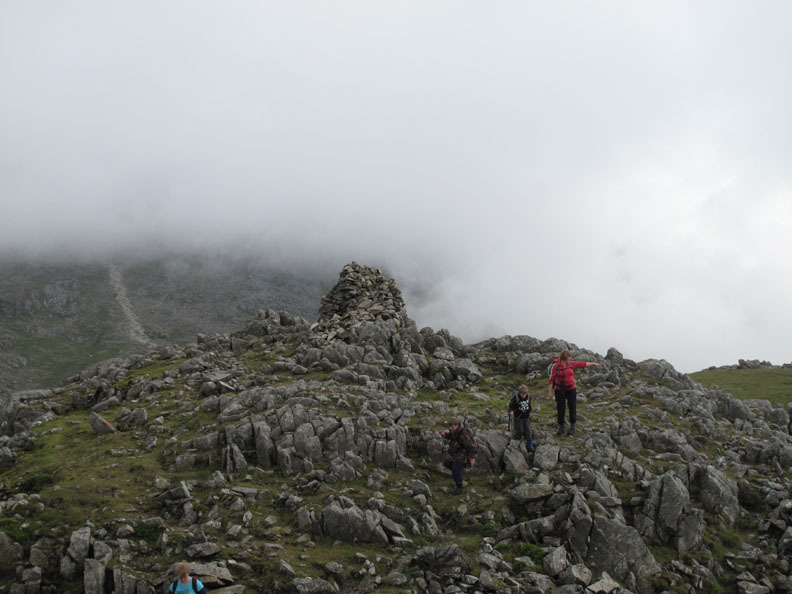 Reaching the base of the Scafell Pike Crags the cloud is coming and going with dramatic effect. Everyone is walking well and it looks like a summit bid is on ! Are we nearly there yet Pop ? Four minutes and a bit later . 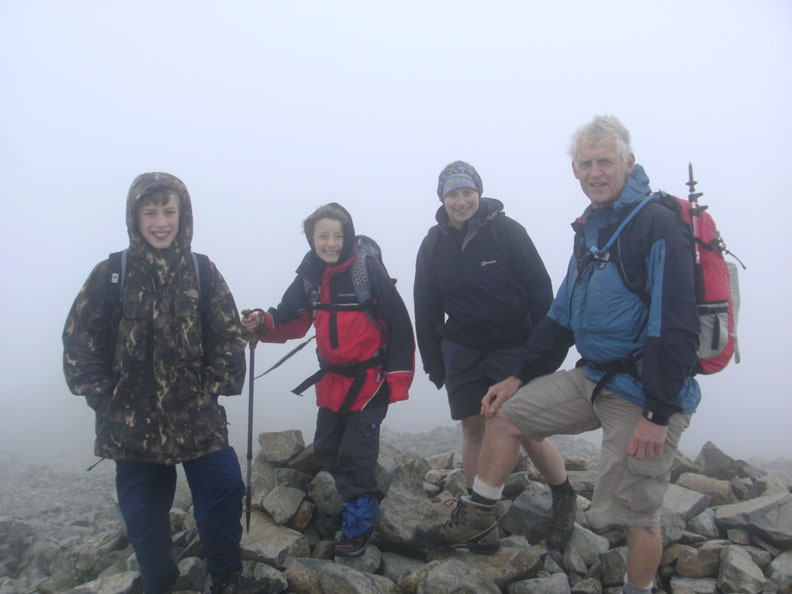 . . Tom and Sam touch the trig point on Scafell Pike ! 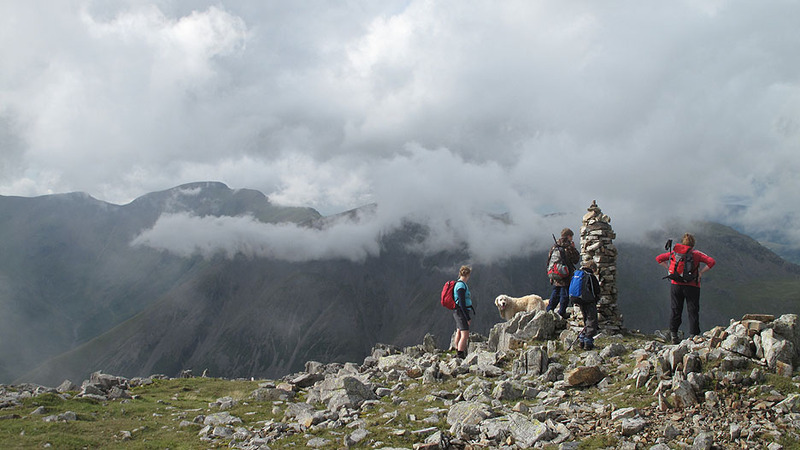 The weather has been kind and as we climbed so the forecasted improvement had arrived. It was still cloudy on top but it was dry with only a slight breeze. 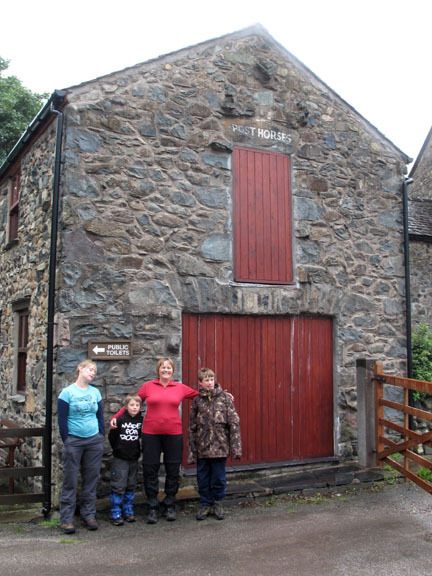 so we adjourned for the second half of our lunch in one of the stone shelters. Tucked away out of the breeze just below the summit. Smile for Paula . . . who was taking this photo on Tom's camera this time. It looks like they were more worried about losing their sandwiches ! used as a head scarf . . . and not implying any lack of clothing ! on the way up and continued to do so now. 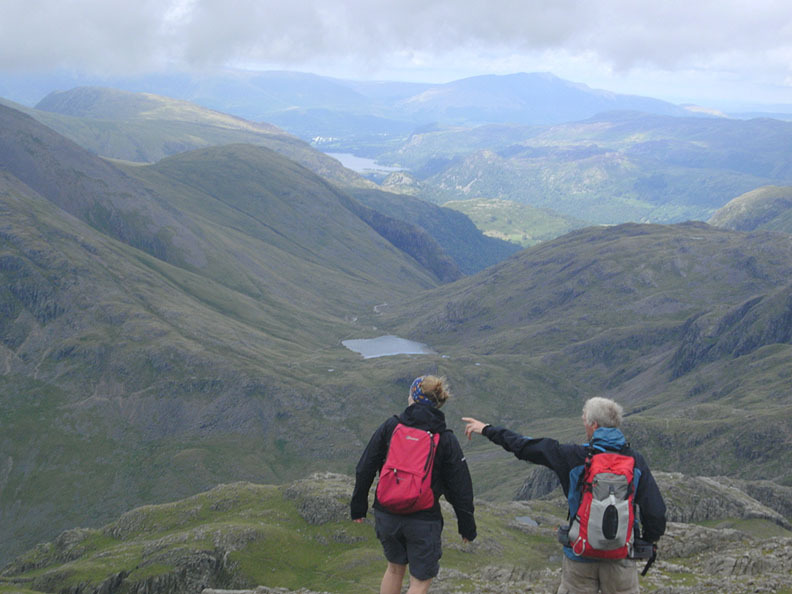 allowed me the briefest glimpse of Windermere from our summit lunch spot. 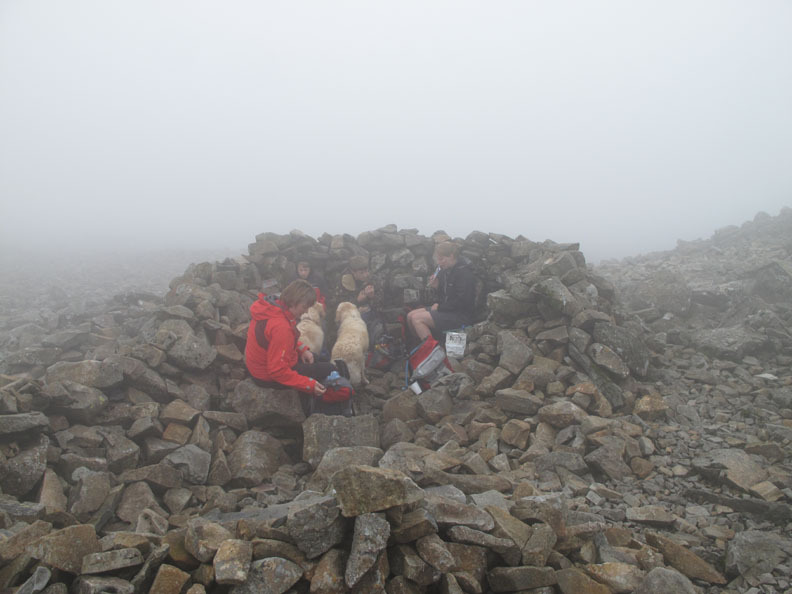 The summit cairn clear, it was our turn to climb to the highest point in England. 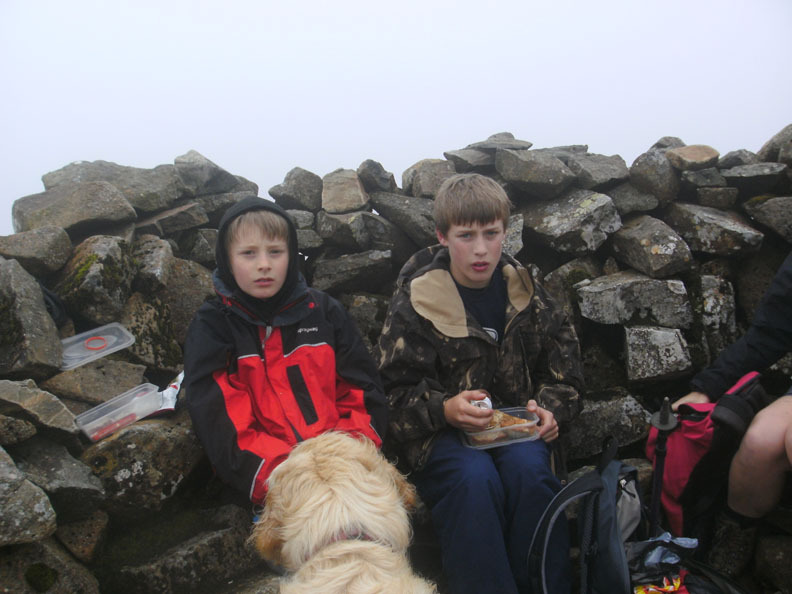 Paula, Tom and his cousin Sam on the top. 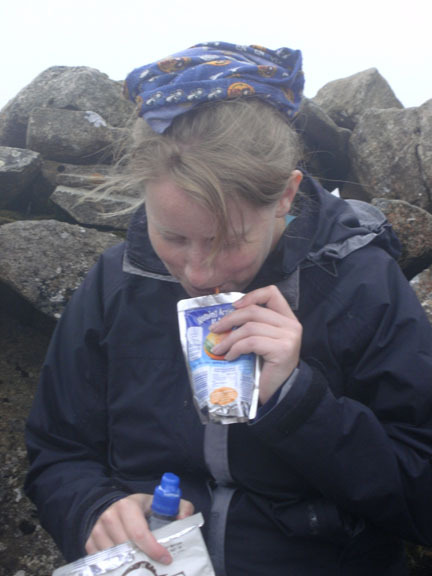 Jenna bags the trig point . . . the dogs don't get a look in ! 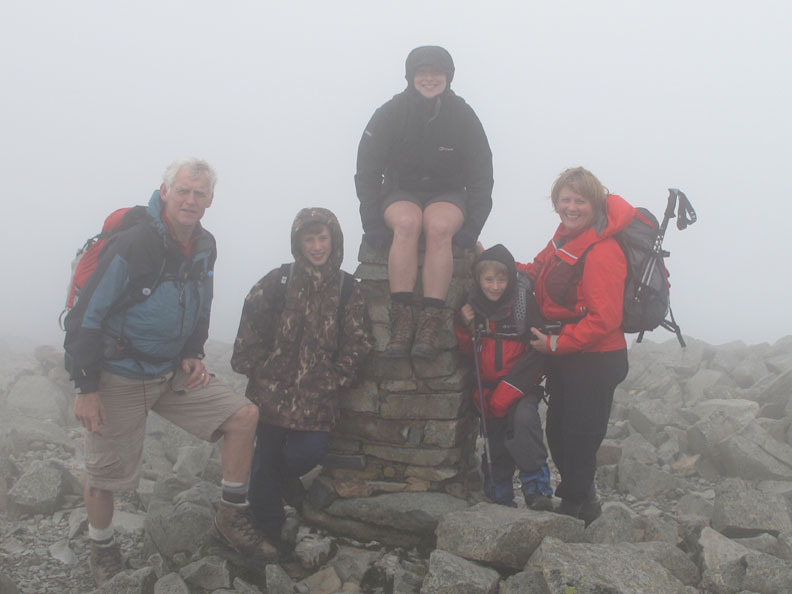 A photo by one of the only two other people left on the summit. Many thanks whoever you were. 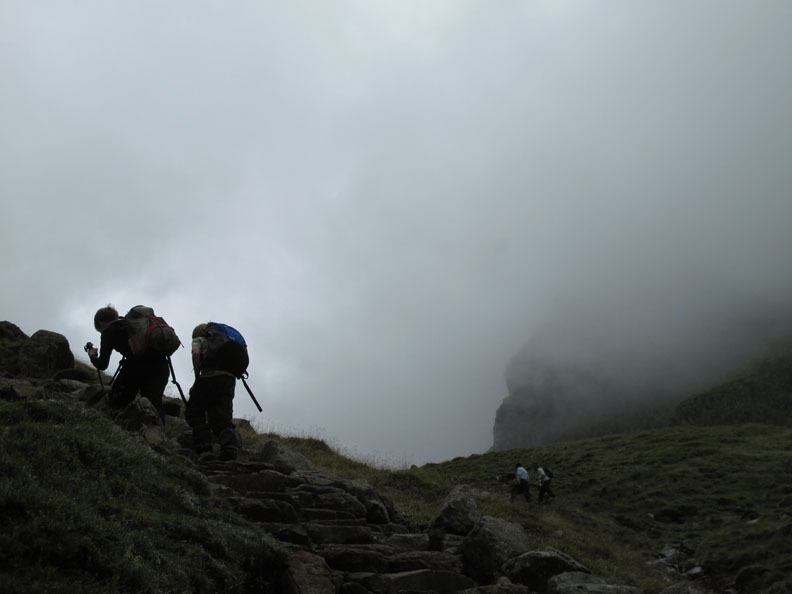 Making our way back down and we start to see below the clouds. 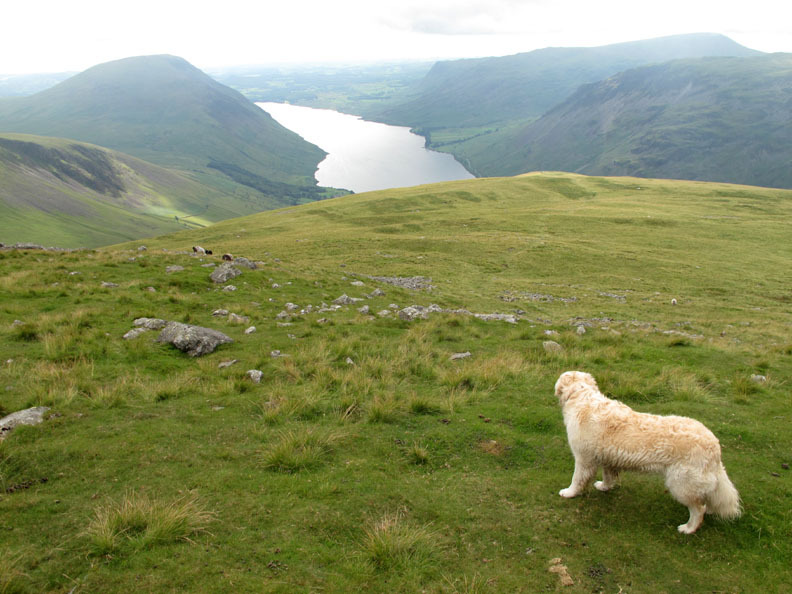 I point out Great Gable (away to the left) and Styhead Tarn and Borrowdale below, for Jen. Suddenly the wind had blown the clouds away and it was like a summer's day at last. 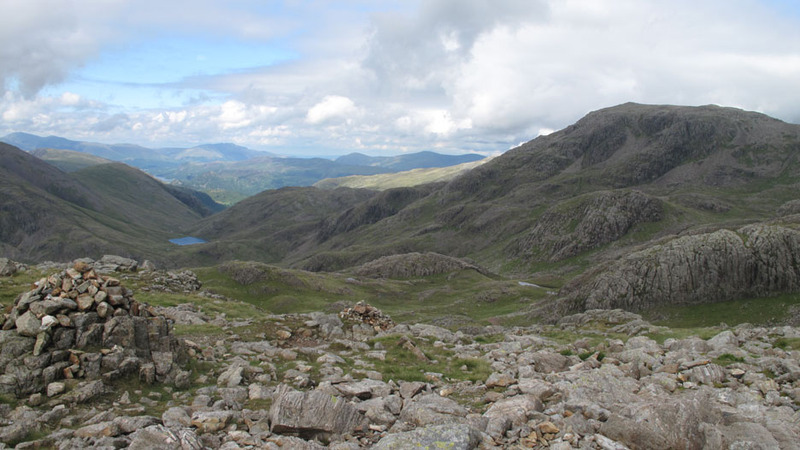 Great End and Broad Crag . . . the tops were starting to clear. 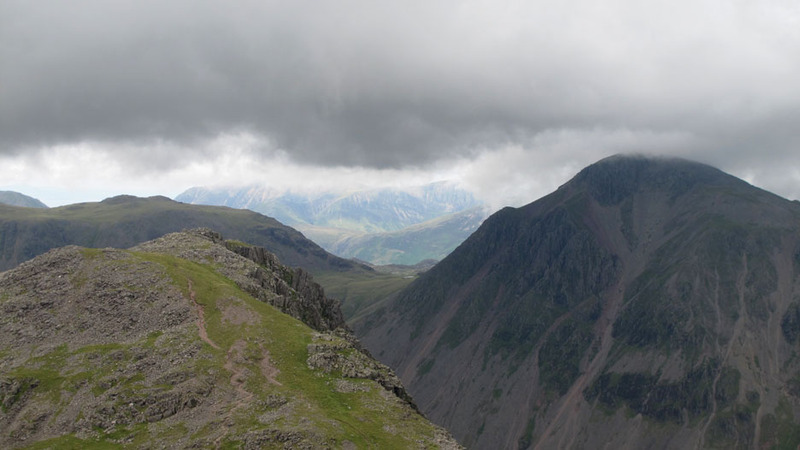 We could see through the gap to Esk Pike on the right . 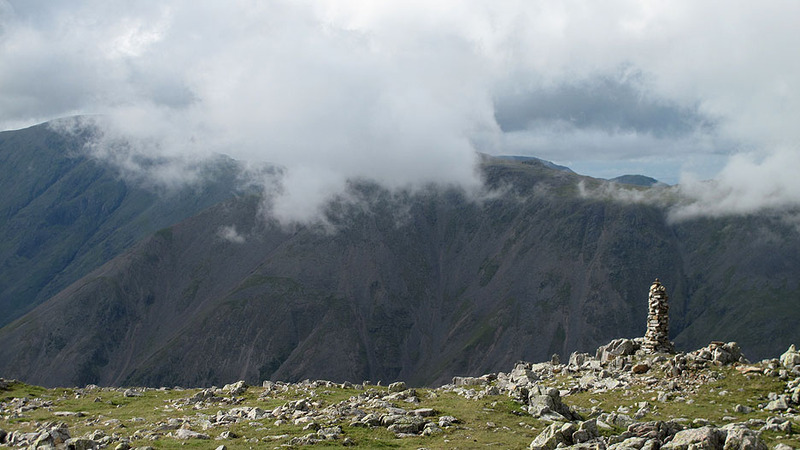 . . and to the Helvellyn ridge away to the left. 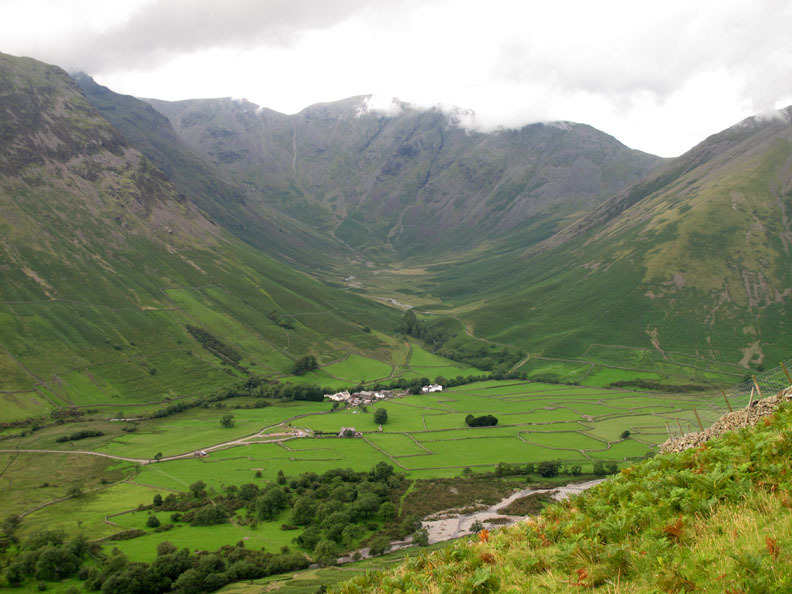 Ahead was the colourful slopes of Grasmoor in the Buttermere Valley. The rocky descent below the slab we had climbed earlier. Down now at the point where the cairns lead you across to the start of the Corridor Route. 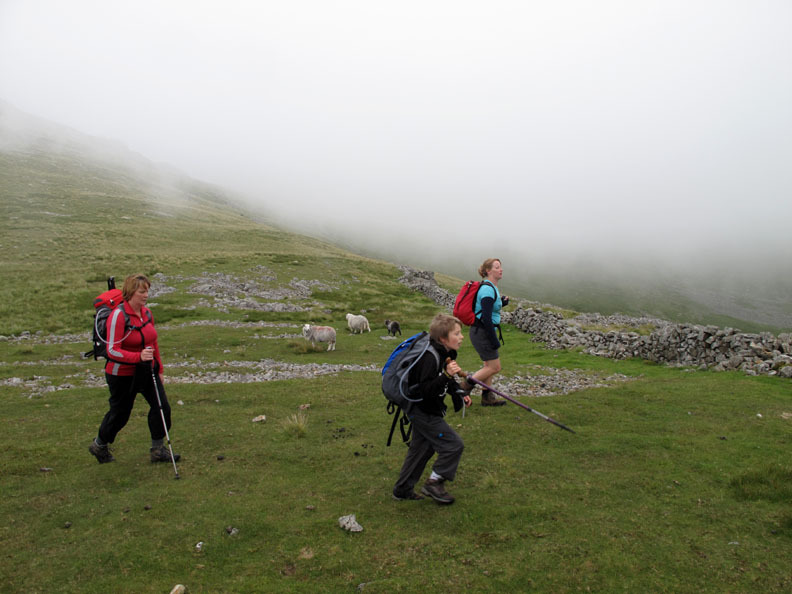 We break off and follow them for a short distance in order to get down to Lingmell Coll itself. 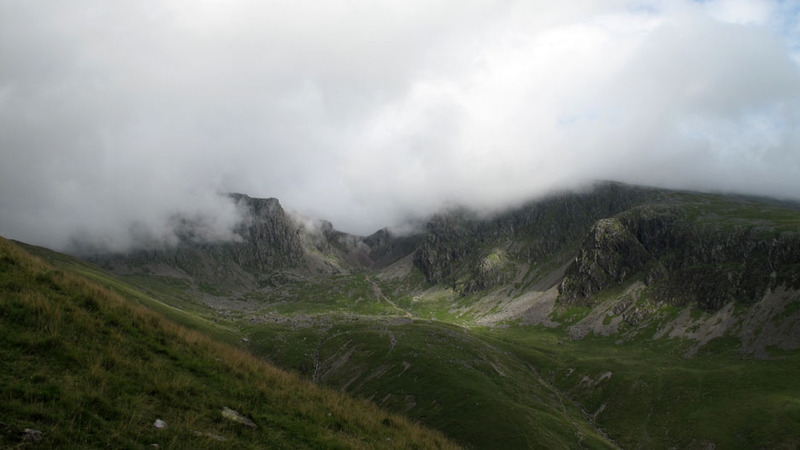 Looking back, the cloud was swirling beautifully up past the Scafell Crags and Lord's Rake. though the photo doesn't really show it unfortunately. 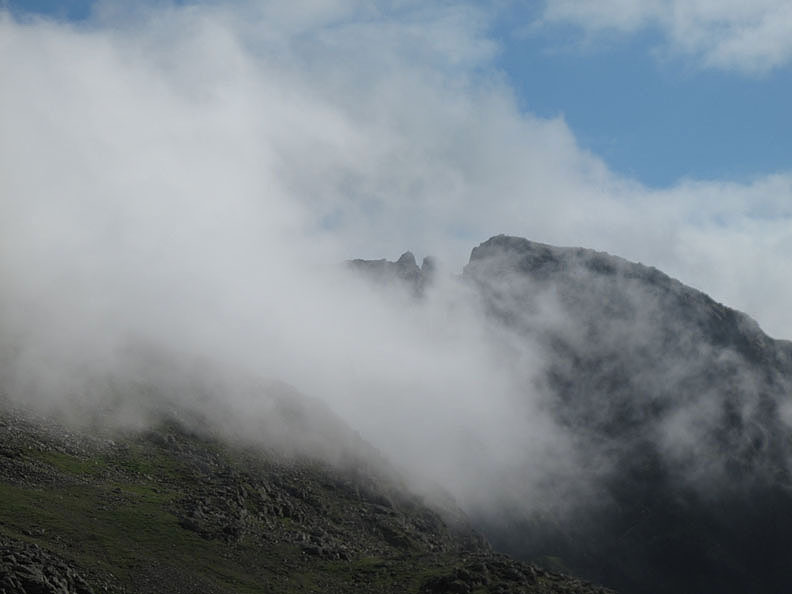 More cloud forms, lifts and flies up the gullies and buttresses of Scafell. 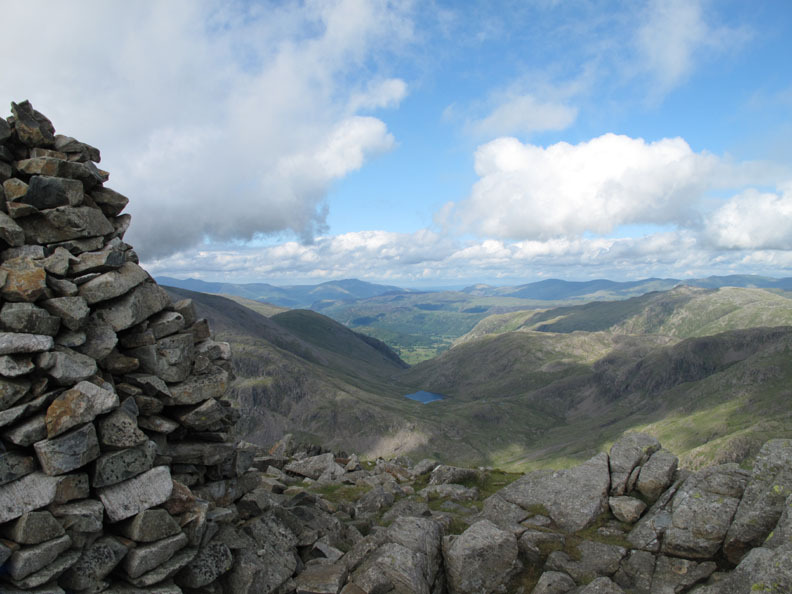 Styhead Tarn and Borrowdale from the summit Cairn of Lingmell. Summit number two today for the boys and ourselves. 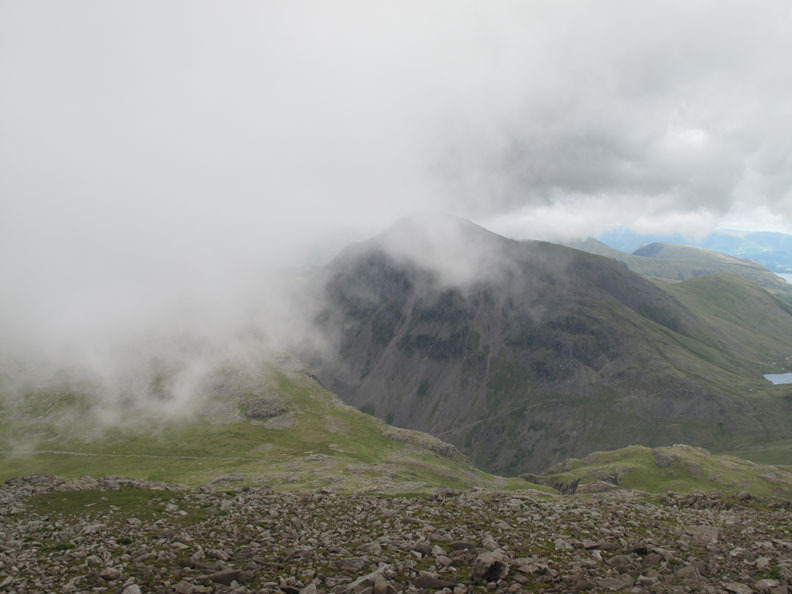 The brief window of fine weather starts to close as heavy cloud rolls in across Scafell Pike again. 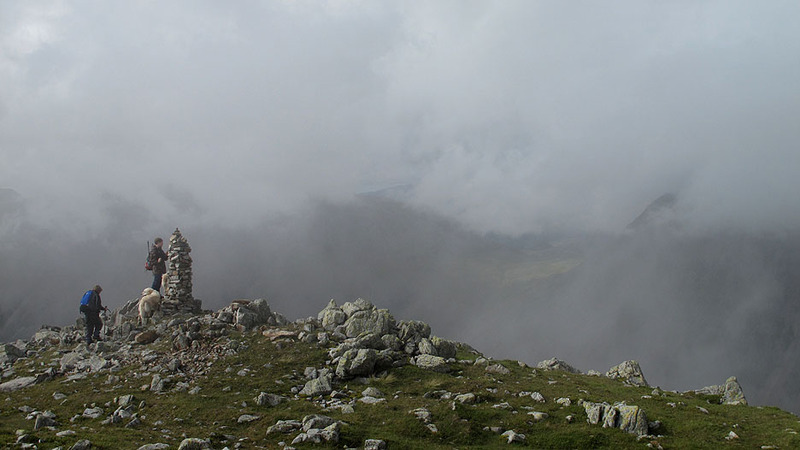 The distant summit path can be seen climbing into the mist once again. 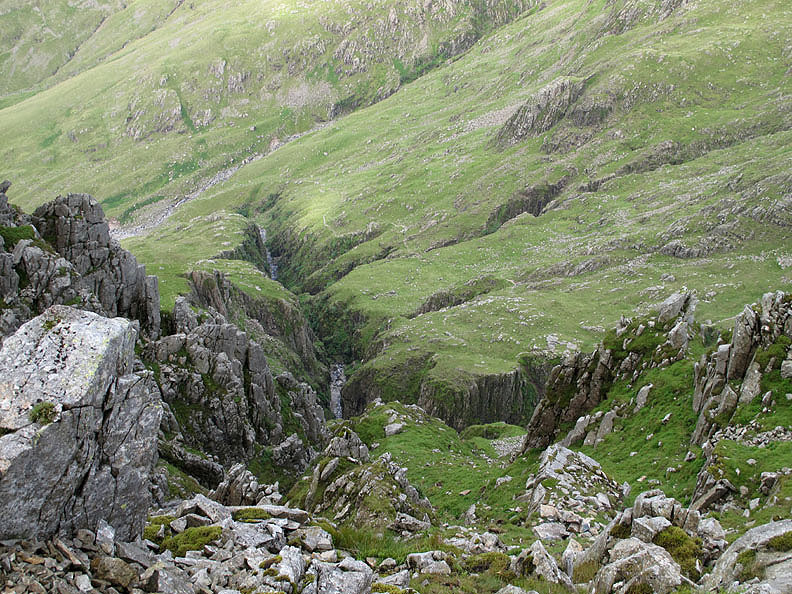 From Lingmell's rocky edge we can look carefully down into the depths of Pier's Gill. 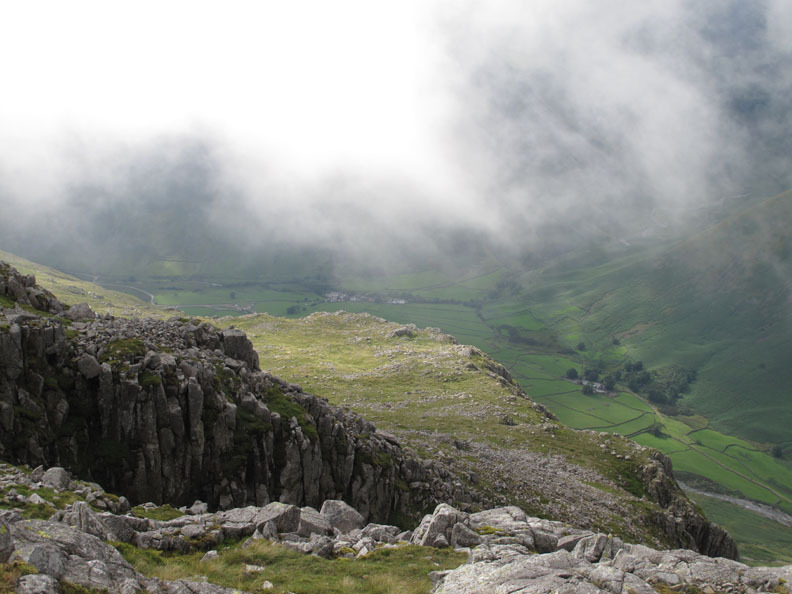 The next objective is a second and very slender cairn on Lingmell's western slopes. 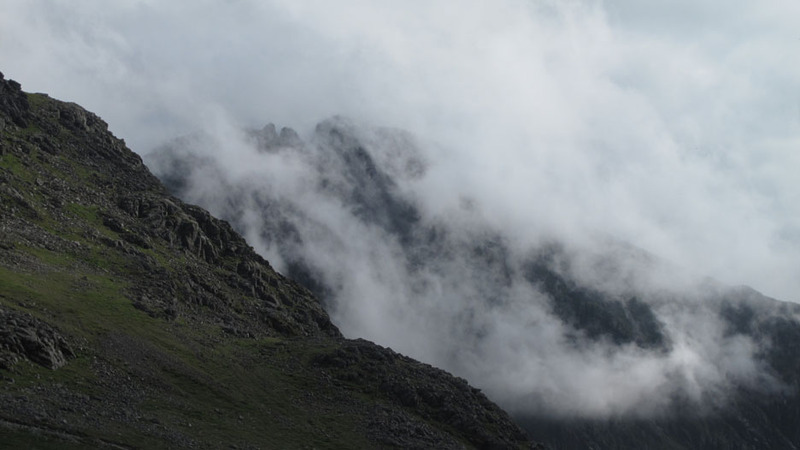 temporarily hidden by more cloud. as everyone arrives at the cairn. 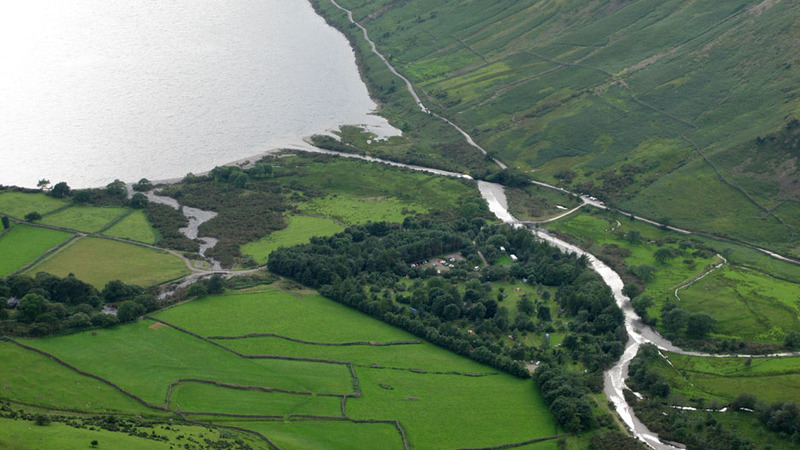 with the farm and the Wasdale Head Inn far below. 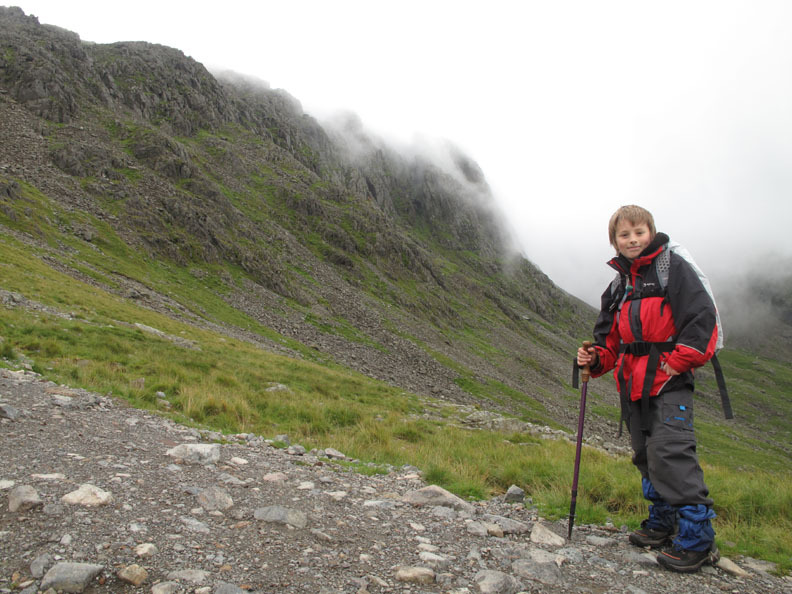 Time to be making our way down Lingmell's grassy slopes and back to the car. 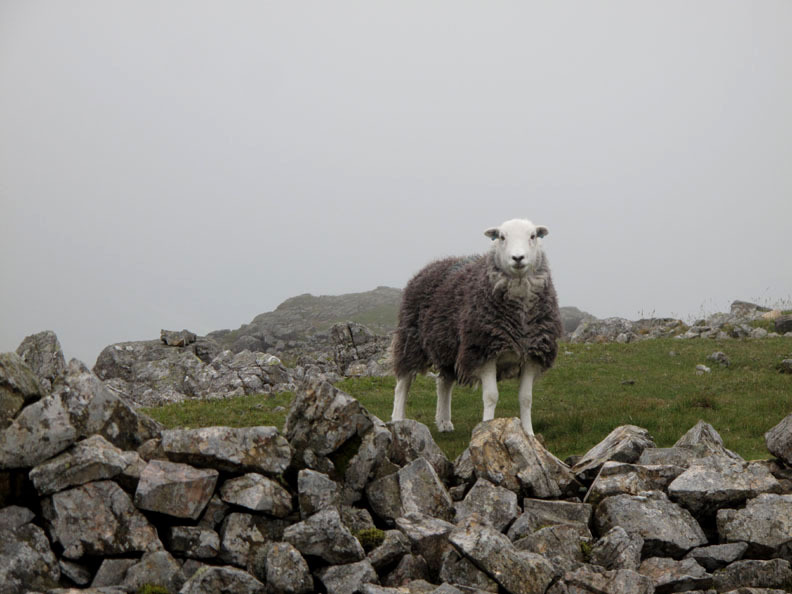 One of the locals stops to watch our passing. 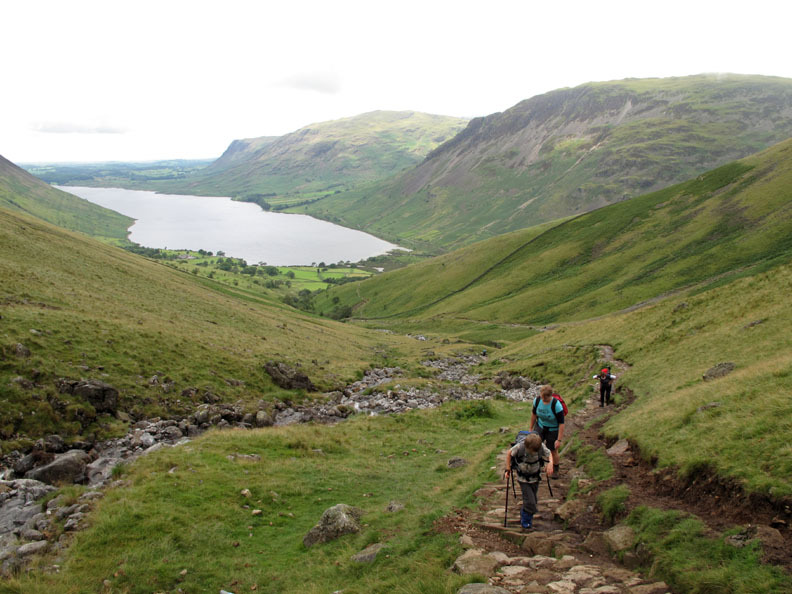 we emerge onto the broad grassy slope of Lingmell . 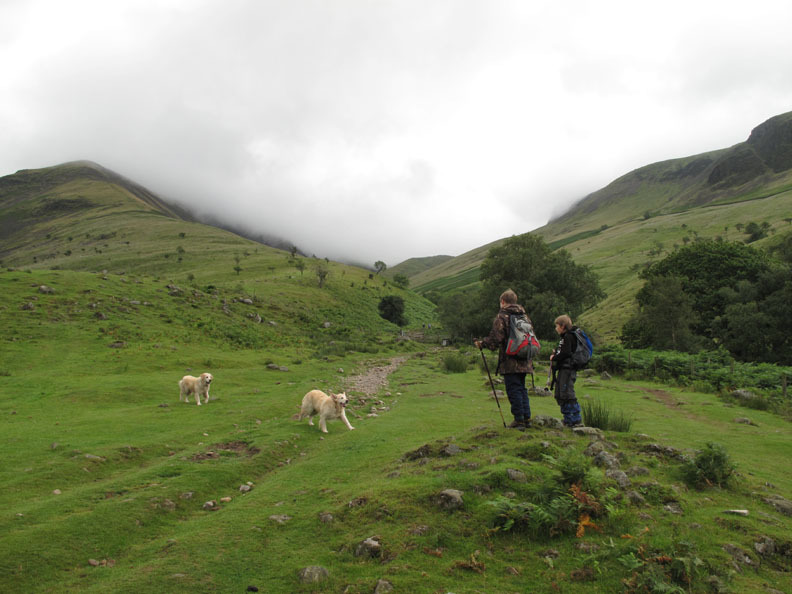 . . a nicer descent than the pitched, stone path of Brown Tongue. 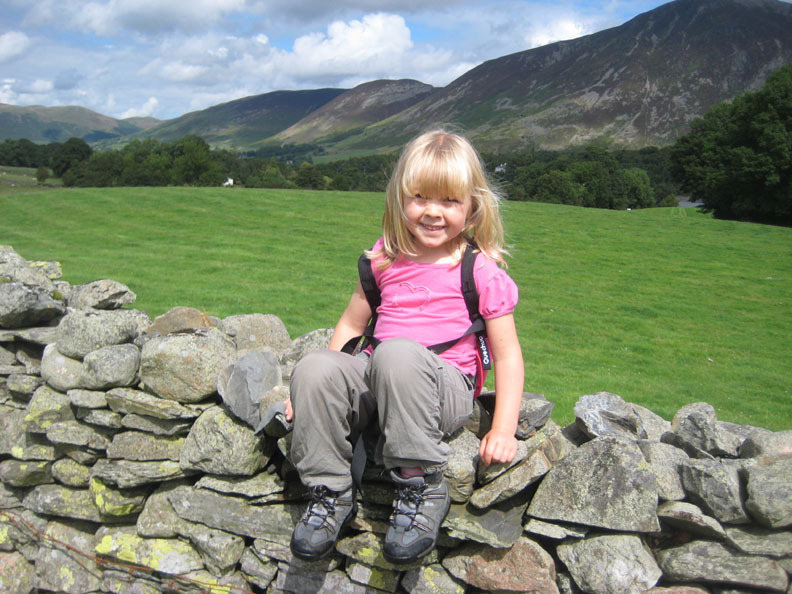 Over here we get a nice view of Wasdale and it's famous stone walls. 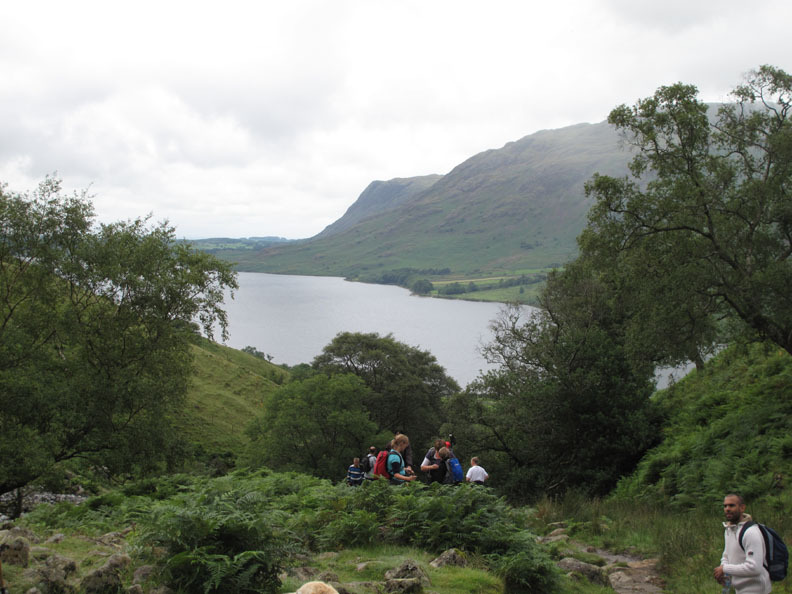 Directly below, as we reach the steeper section of the descent, is the Brackenclose NT campsite. 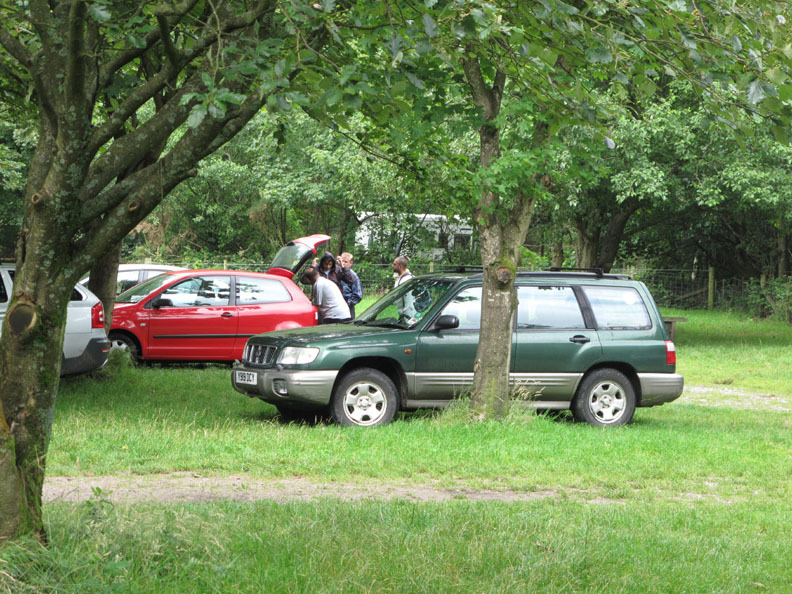 Our car is parked in the trees on the lake side of the camp. More changes in the cloud and sunshine patterns . . . and Mickledore is briefly illuminated once again. 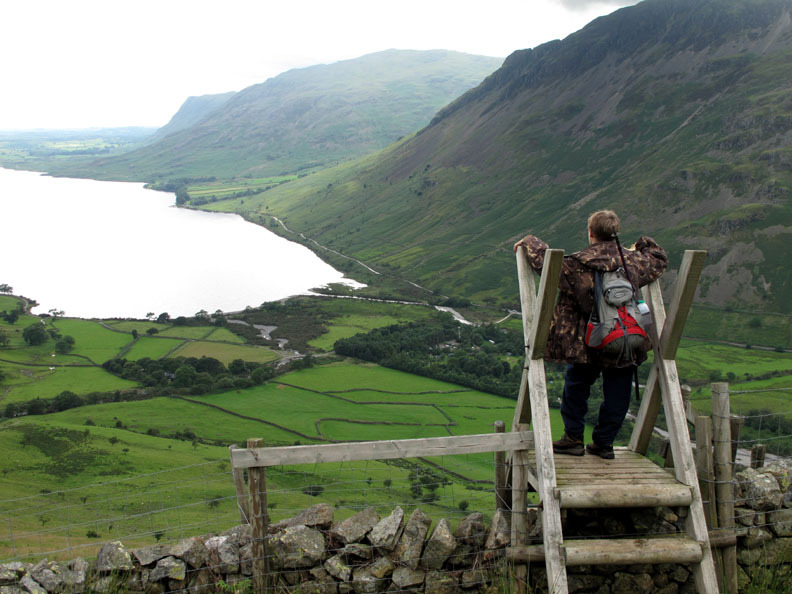 Sam in his "stile-ish" new jacket as he looks down on Wastwater from his high vantage point. 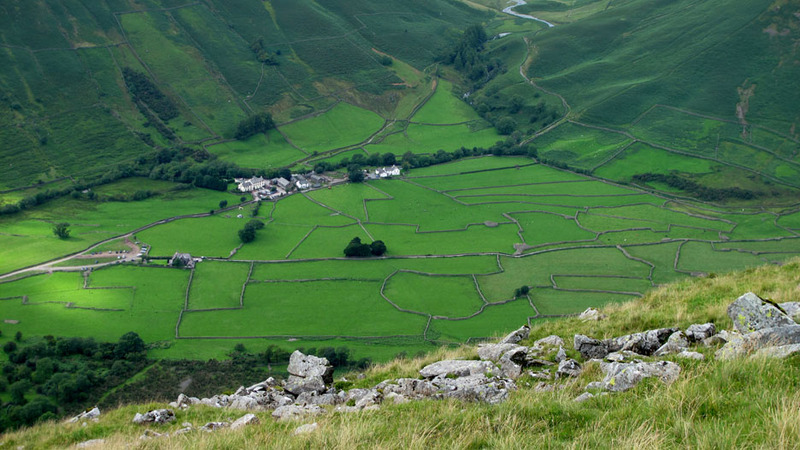 this time with the backdrop of the Mosedale Valley and Pillar Fell. and continue on down the short distance to Brackenclose. I think this is where we came in . . . six hours ago. 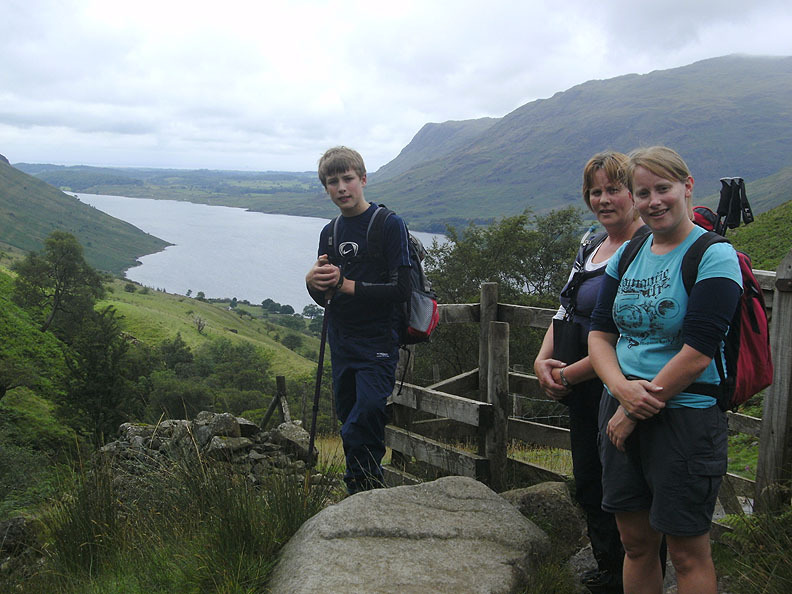 Surprisingly this was the first time any of us had completed the direct ascent from Brackenclose all the way to the top. 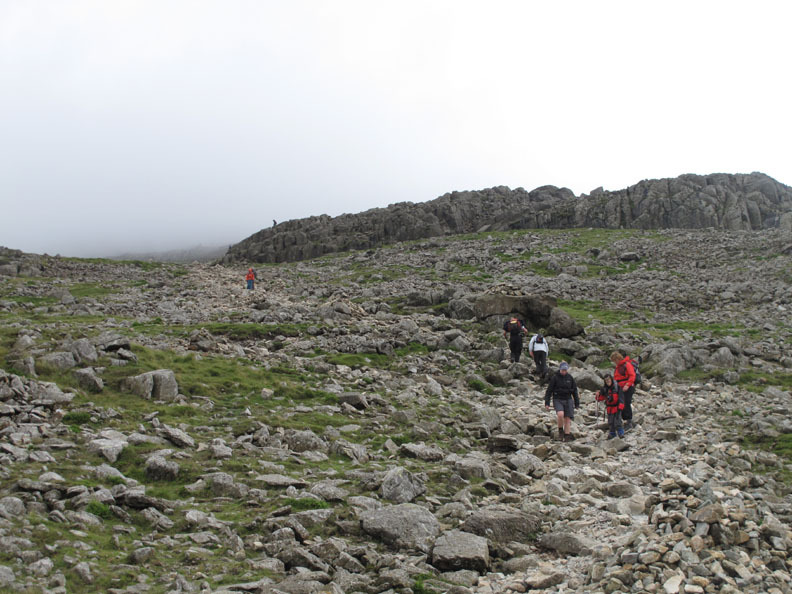 Ann and I have climbed Scafell Pike several times but never using this route. 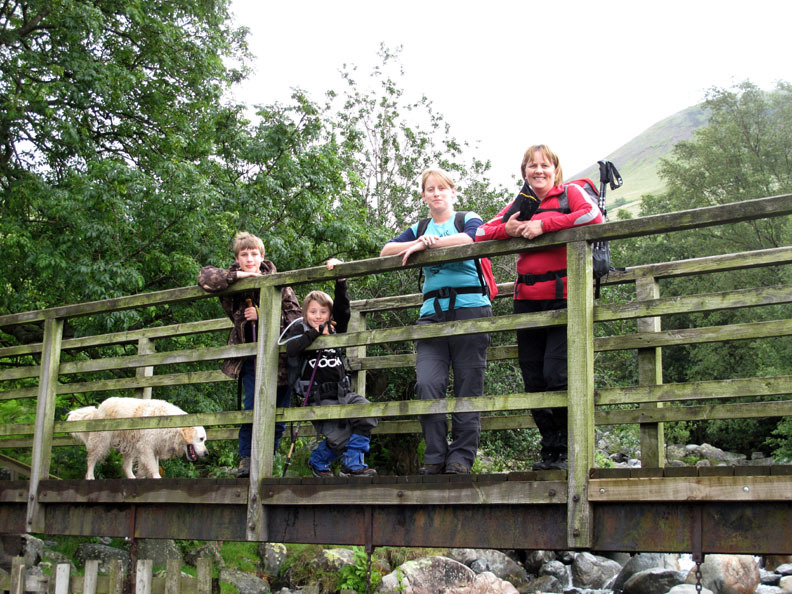 We always seem to walk it from Seathwaite. By the way . . . where was Ann today I hear you asking ? She was looking after Abi, Tom's little sister and our granddaughter . 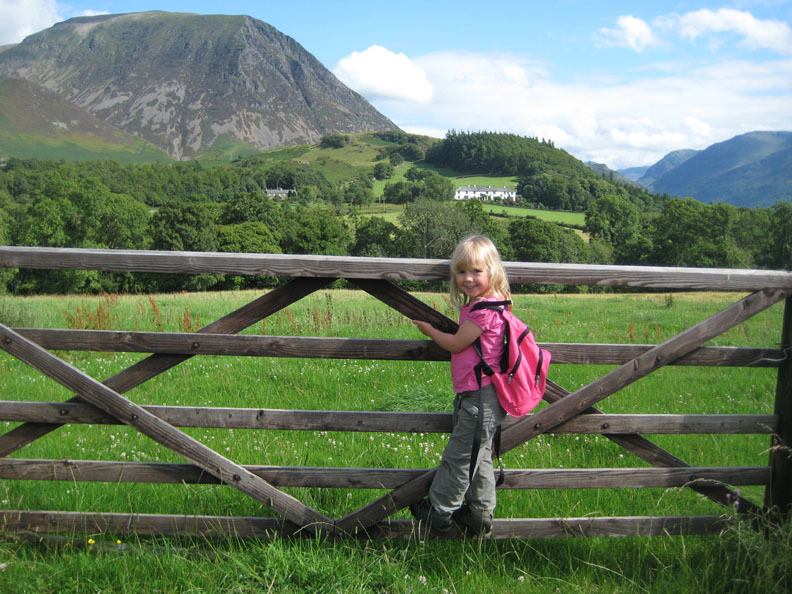 . . back home in sunny Loweswater ! 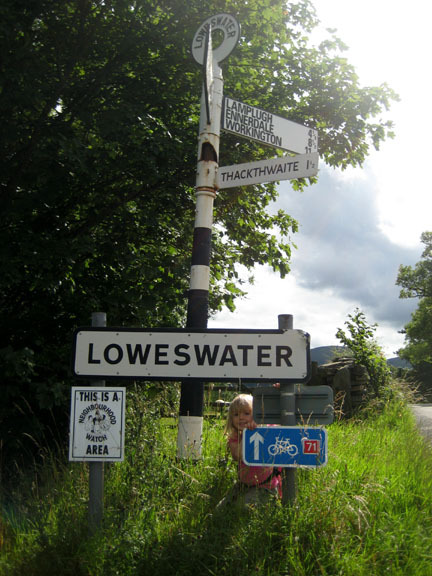 Abi by the signpost in Loweswater. 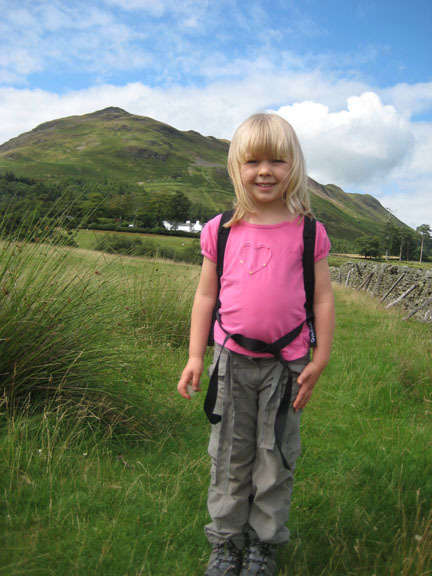 At 4 yrs old she was just too young for the big climb today. Abi and Ann had a great day out visiting friends and neighbours. as they enjoyed a stroll along the lanes and fields near home. 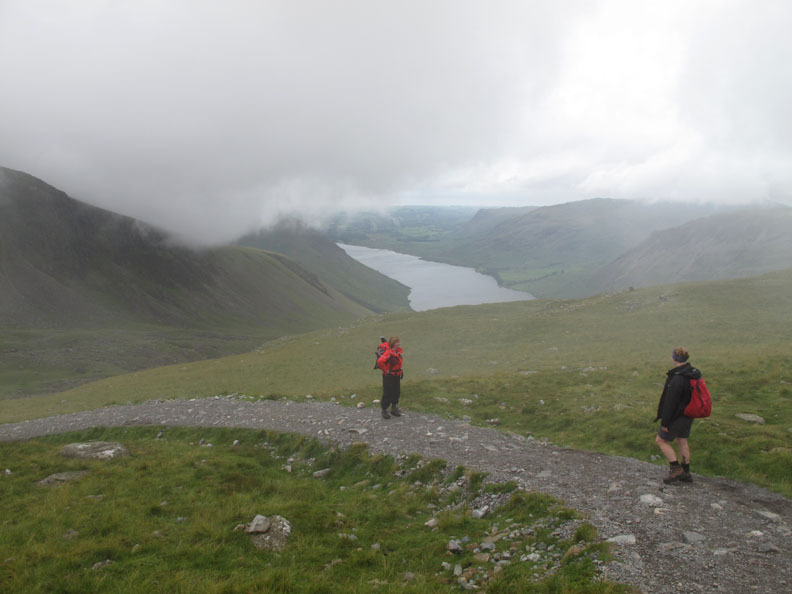 as we were looking at the other side of it after our successful climb of Scafell Pike. One the way up the fell we kept finding bottle tops on and alongside the path. These had obviously been discarded by walkers more intent on the task ahead of them than the litter they left behind. 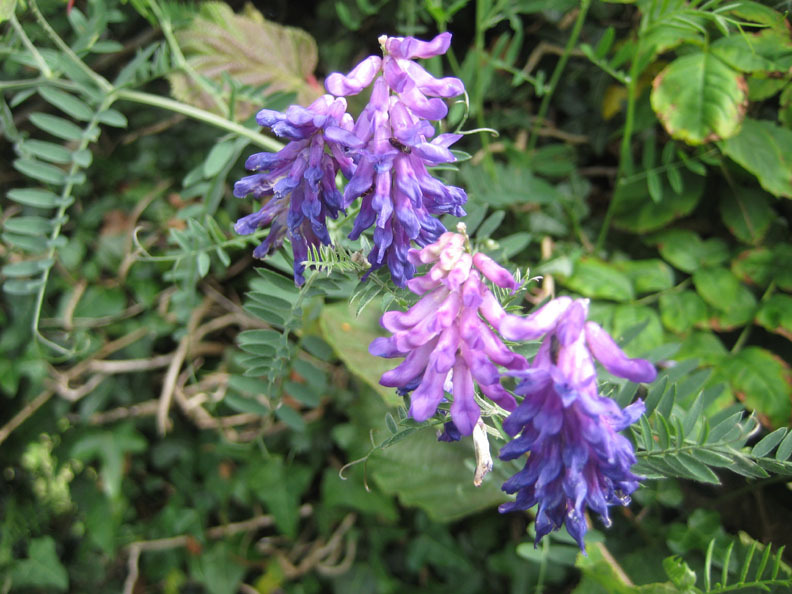 It became a little bit of a competition to find these and to estimate how many of each colour we would end up with. 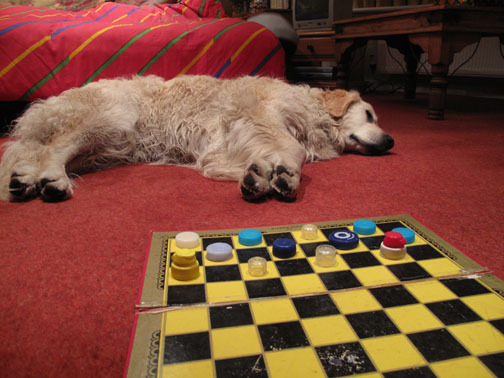 I suggested that, by the end, we could play naughts and crosses . 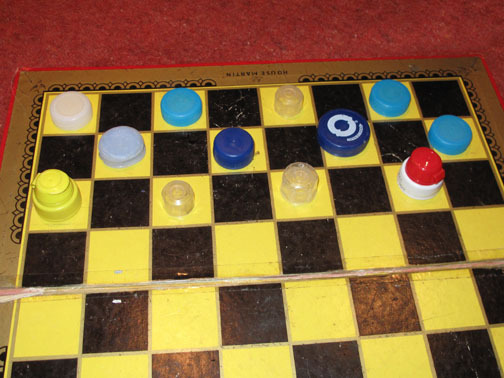 . . as it happened we were half way to a draughts set. Shame they were not all the same colour . . .
. . . and that one possible opposition player was already fast asleep ! Technical note: Pictures taken with either Ann's Canon 75 or my Canon G10 digital camera, plus one or two from Tom's again. This site best viewed with . . . three happy grandchildren.